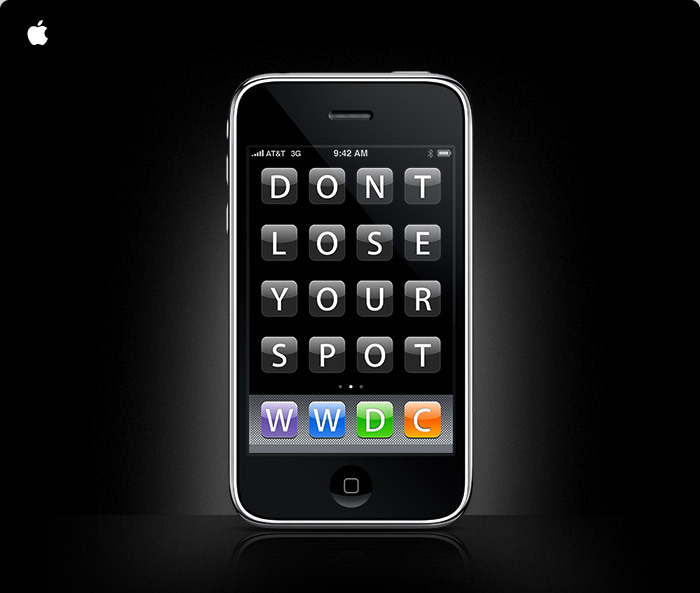 Don't lose your spot. WWDC. Get your WWDC ticket before they're gone. Apple Worldwide Developers Conference. June 8-12 in San Francisco. Don't miss this unique opportunity to capitalize on the amazing possibilities of iPhone OS 3.0. At WWDC, you'll get the latest information about the APIs and robust developer tools included in the new iPhone SDK—directly from the engineers who created them. There's no better way to take your iPhone app development to the next level. Tickets to last year's WWDC sold out. Don't wait. Purchase now and save $300. My birthday is in the middle of that too, I can just see it now my friends asking me what I want to do for my birthday and I respond "Fly to San Fran and go to a Developers Conference" oh and let's not forget the prices...US $1295.00 when you purchase by April 24 — a $300 savings. Even if was knee deep in iPhone programming I wouldn't spend that money.